Located in Kerala, Varkala is a small town steeped in history and famous for its beautiful beaches. 2000-year-old temples will appeal to history buffs and culture-lovers while palm-covered red cliffs, white sand, and the warm, Arabian Sea will draw in travellers more in touch with nature (or those just hoping to relax). 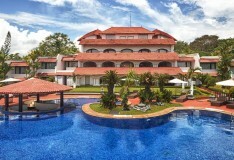 Kerala is hot all year around with temperatures between 27°C and 33°C throughout. But, if you’re looking to maximise your exposure to the sun (and who isn’t while on holiday?) you’re best off visiting between November and May when you’ll experience up to 10 hours of sunshine per day. On the other hand, between June and September, you’ll be limited to just 2-5 hours per day. This is also when humidity and rainfall are highest. While the beaches and temples are the main draw here, there are plenty of other attractions worth visiting. Two favourites are Varkala Aquarium and Golden Island. Varkala Aquarium, located between Black Beach and Odayam Beach, is filled with large tanks of exotic fish, including piranhas, sea snakes, and scorpion fish. Tourists rave that it’s a must-see and we have to agree. After all, where else can you (safely) see piranhas? If you’re looking for a day-trip, check out Golden Island (known locally as Ponnumthuruthu Island), located 10km south of Varkala. Boat rides to and around the island are inexpensive and offer wonderful photo opportunities. Varkala is famed for its beaches and is recognised as one of the best beach resorts in all of Kerala. For those wishing to rid their bodies of impurities, head to Varkala Beach (also known as Papanasam Beach) where locals believe the water is holy and has healing properties. If you’re not interested in holistic medicine, it’s still worth a visit with stunning views and plenty of shops and restaurants. The North Cliff Beach is less popular, but equally as beautiful. And, if you’re looking for an undeveloped beach, you can travel just 9km south to Kappil Beach. This beautiful Indian hangout is filled with cafes and restaurants serving a range of delicious cuisine. Pull up a chair at Trattorias for pasta, pizza, Asian and Indian cuisine. If you prefer your dinner with a view, take the elevator up to the aptly named Wait n Watch restaurant, serving seafood and local fare. While Varkala is laid-back resort more famous for yoga retreats and mineral springs than nightlife, there are plenty of spots you can enjoy a cocktail, beer, and even live music. During the high-season God’s Own Country Kitchen serves up good food and, on the upper deck, you’ll find live music. If you want to rub shoulders with the locals, head to Karthika Bar near the Varkala train station. 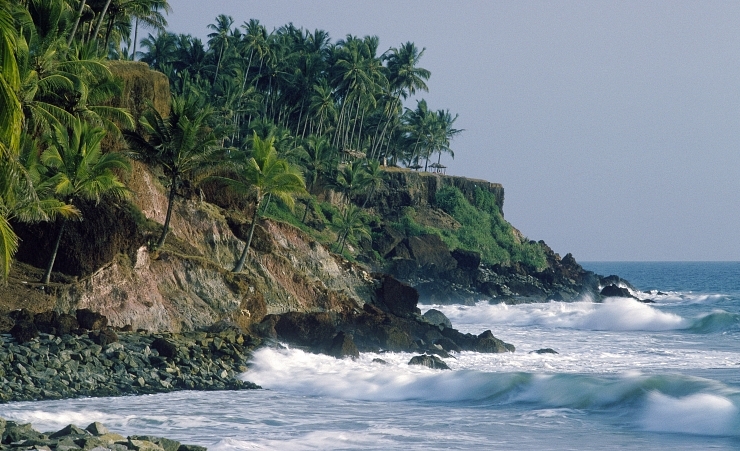 Varkala is well known for its history, culture and religious significance. The ancient Janardanaswamy Temple, nestled on a nearby hill, is a Hindu pilgrimage site dedicated to Vishnu. Farther inland, the Sivagiri Mutt Monument memorializes the social reformer Sree Narayana Guru, who is buried here. Given the number of beaches in and around Varkala, your options for watersports are almost limitless. You can rent a jet ski for the afternoon, saddle up on a banana boat, or even strap into a parasail. If you’re not interested in getting wet, you can explore nearby temples on rocky cliffs, take a yoga class, or rent a scooter to ride around on. While in Kerala, you can hop on a local bus or hitch a ride on an autorickshaw. If you’re comfortable, though, the best way to get around is via a scooter which you can rent cheaply. The Varkala railway station is well connected and just 3km away while the nearest airport – Trivandrum International Airport – is just under 60km away. Located on the southwestern coast of India, Kerala is hot all year around with temperatures between 27c and 33C all year. The highest sunshine hours per day are Nov - May with aprox 10 hours per day, this falls to 2 - 5 hours per day Jun - Sep. Humidity is between 70 - 85% with the highest humidity being from July - Sep. Monsoon season is from June-Sep with between 260 - 620mm of rainfall per month, the remainder of the year is generally very dry.